What is a Bread Making Machine? Store-bought bread will never ever compare to homemade bread. When I was a kid, mom used to make it using yeast, let it double in bulk, punch it down, cover with a towel and sit over the register with warm air from the furnace to help it rise. I loved that smell and even more wonderful, was the smell when it was baking. Eating it warm with butter and honey or mom’s homemade black raspberry or strawberry jam—berries she grew—was a taste pleasure I’ll never forget. The best bread makers were not manufactured at that time. The flavor and crispy crust was the best ever! Not even artisian breads at the markets will come close to homemade bread, sweet rolls, bread sticks, and all the other goodies to be made with the best bread machines on the market today. Fresh baked, warm, and soft with butter—heaven forbid, no greasy margarine—a touch of jelly or honey and a steaming hot cup of coffee, tea, or cocoa is a bread lover’s delight. The kids would love it with peanut butter and jelly, I’m sure. For baking bread, we can now use the kitchen appliance either called a bread making machine or bread maker. It has a bread pan that used to be called a bread tin at the inside bottom of the unit’s housing. It has one, two, or more paddles (beaters) built into the center, usually. It is really a small oven using simple electronics built into its computer inside. You select your desired setting on the control panel, usually digital. 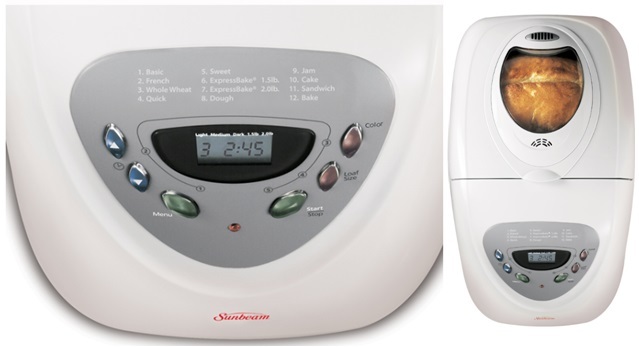 Most of the best bread maker machines have timers to start without needing your assistance. The high-end brands have custom cycles so that you can create a recipe. 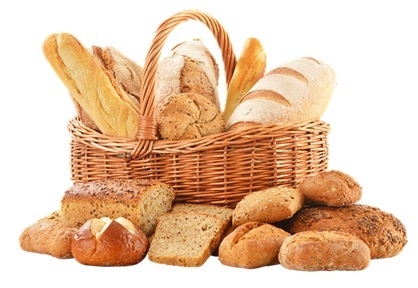 Bread makes have distinct sequences for the type of bread you want to make such as while, whole-wheat, whole-grain, French, Italian, fruit bread, vegetable bread, gluten-free or with gluten bread. You can select the dough only cycle for making pizza dough and different shaped loaves that you will bake in a typical oven. On another note, the first bread maker appliance was released in Japan in 1986 by the Matsushita Electric Industrial Company, now Panasonic®. Making bread with a home bread maker is easy to do. It is not as time consuming as making bread like my mom did, yet some people still do. There’s virtually no work to do when you use a bread maker. All you do is buy the mix or use a recipe. You simply add the ingredients to the maker and push some buttons and it does all the work for you. Then sit back and enjoy the aroma wafting through the house. When the time is up, cut a slice and enjoy your homemade creation! Discover the different models and features, machine sizes, and the number of loaves they make in my reviews below. Some make bread only and others make even more scrumptious goodies. You will no doubt want a timer and even a window where you can see what’s bakin’! There are many models to choose from with many different features that you will want to consider. Read my bread machine reviews below and buying guide for small bread makers and large bread makers as well. Today’s bread makers are inexpensive with many features for you to make your perfect loaf each time. When you have gluten sensitivities, you can make fresh bread with flour without gluten. You can make many types of bread and here are some favorites that are easy to make without the work of making if from scratch. Read further for features and loaf sizes, crust color, recipes, tips, and more below. Many more bread types and flavors are available. You can use your own recipes as well for the best of the best bread ever. 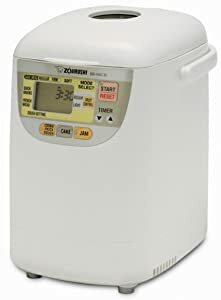 The ZOJIRUSHI is a Japanese Corporation, and the model BB-PAC20, is a small bread maker shown on Amazon.com® just perfect for turning out beautiful bread every time made of steel. This machine is ideal for a smaller family. It has many functions that will surprise you. It has 2 kneading blades and another heater on the lid for even and complete kneading and baking. This is the only model with a heating element in the lid! The panel has an LCD (liquid crystal diode) clock with a 13-hour time delay function with 3 memory settings. The large handles on the baking pan are easy to use for handling and removal with a large viewing window to watch your bread bake. 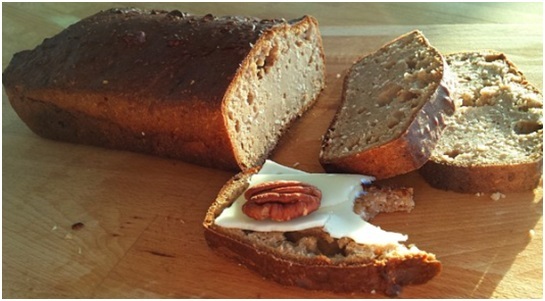 Its new gluten-free menu setting lets you make gluten-free breads easily with no effort. You can use the quick baking cycle to make bread in about 2-hours. Add seeds, nuts, grains, raisins, spices, flavorings, herbs, and other items to your bread dough. The menu settings are for basic bread, wheat bread, gluten-free bread, sourdough starter, dough, a fresh fruit jam cycle, cake, quick bread, and 3 homemade menus to bake a meatloaf for instance. It will also make salt-free, sugar-free and vegan. 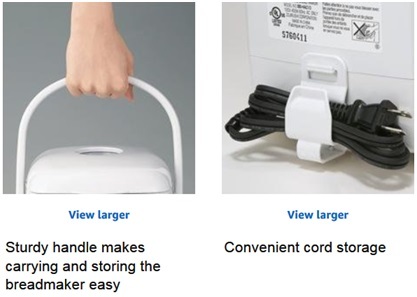 Plug the 3-foot, 3-prong grounded UL® listed cord into a 110/120-Volt, 50/60 Hz receptacle. It does not work on 220/240-Volts outside the USA or Canada so buy an adapter. It operates at 700-Watts power. The dimensions are 18-inches wide x 10-1/2-inches deep x 12-7/8-inches tall and weighs 22.08-pounds. You will receive 2 kneading blades, an easy-to-follow instructional DVD, User’s Manual in English and French for Canada, and a recipe book for cinnamon roll bread, mini white bread, meatloaf miracle, homemade pasta, gluten-free dinner bread, and more. You’ll also get a liquid measuring cup, nested measuring cups, and a measuring spoon. ZOJIRUSHI AMERICA CORPORATION (‘ZOJIRUSHI’) Warrants this product against defects in materials and workmanship for a period of 1-year from the date of original retail purchase. Commercial products have a 6-month Warranty from the date of purchase. In both cases, a copy of the purchase receipt is required. It is made in China. ZOJIRUSHI Home Bakery Virtuoso® Bread Maker demonstration making bread video. The Hamilton Beach® company has been making home appliances for decades with their trusted equipment for home users. Professional chefs and commercial cooks use their products as well. 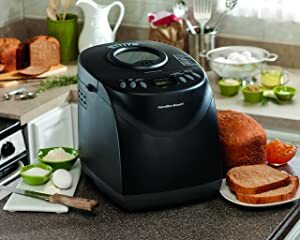 The model 29882 in black durable hard plastic on Amazon.com® is affordable and the top best-selling bread maker. Make your homemade bread the way you like it: without preservatives, gluten, or trans-fat. 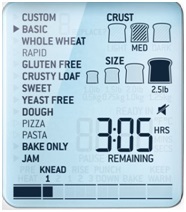 Set the programmable controls for all of your bread loving cravings and even make jam, cake, and cookie dough. It also has an automatic shut off. You will also get whole-grain and gluten-free recipes as a courtesy from Bob’s Red Mill® Natural Foods. 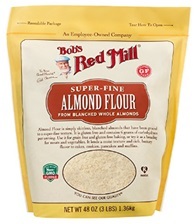 I love this brand, especially the gluten-free almond flour with real almonds. The bread maker has 12 cycles being basic; French; gluten-free; whole-grain; quick bread; sweet bread; flat bread; croissants; 1.5-pound express; 2-pound express; dough; jam; cake; and bake. The unit will also make dough for pizza and rolls with light, medium, and dark crust settings. This bread maker will remind you when you want to add nuts and fruit later in the process of baking with its delay timer mode. It comes with 2 kneading paddles made of metal with a nonstick coating, using only 1 at a time, so if 1 is dirty, you can use the other one. The bread pan is nonstick and cleans easily by hand or in the dishwasher as well as the paddles. The dimensions are 12.2-inches high x 14.13-inches wide x 10.43-inches deep and it weighs 11.9-pounds empty. Plug the 2-prong polarized 3-foot UL® listed cord into a 110/120-Volt, 50/60 Hz receptacle. It does not work on 220/240-Volts outside the USA or Canada so buy an adapter. 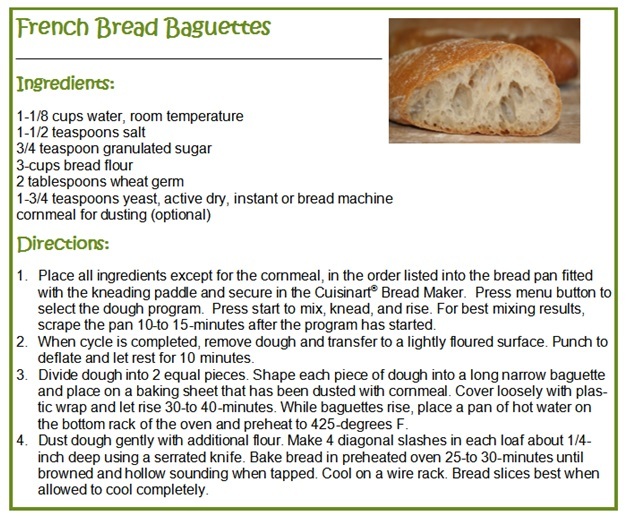 Here’s a delicious recipe from Hamilton Beach® easy to create in this bread maker. The bread maker comes with a User’s Manual, recipes, an extra paddle, and a 1-year Limited Warranty. It does not come with measuring cups/spoons. It is made in China. 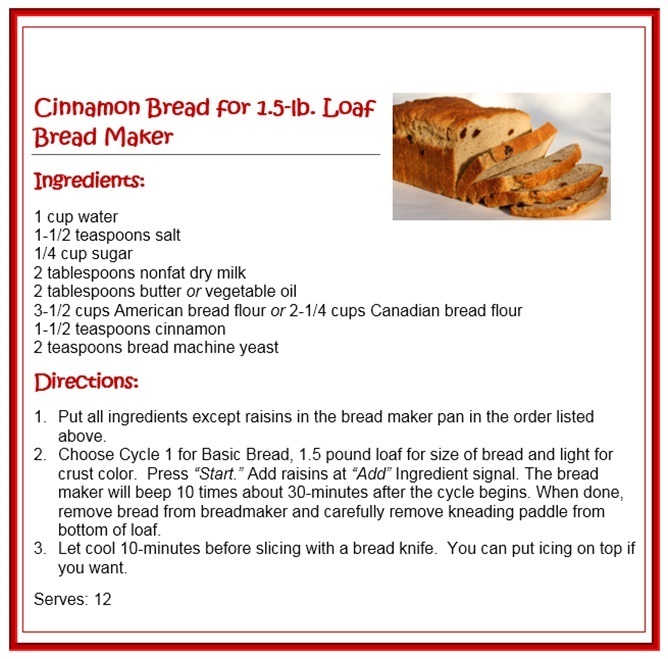 How to make cinnamon bread in the Hamilton Beach® Bread Maker video. The Sunbeam® company has been around for many years. My grandmother and mom owned many of their kitchen appliances, and I do too. 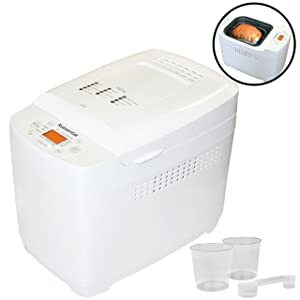 The item model number 005891-000-000 on Amazon.com® is one of the best affordable bread makers. Sink your teeth into the best tasting homemade bread and sweets so much better than from the stores. Use the programming functions with pure healthy ingredients and no additives or chemicals that are used in store-bought breads and sweets. Did you know that feathers are added to donuts to keep the dough light and fluffy? Yuck! So, light as a feather donuts now has meaning! With the machine’s ExpressBake® functioning cycle, you can bake or cook in less than an hour. You can delay your baking process for up to 13-hours in advance and then let it do its process ready for you when you get home from work or get out of bed in the morning. The baking pans are removable nonstick and easy to clean up. It’s best to hand-wash the metal blades and bread bucket. Choose from 12 baking cycles of basic, French, whole-wheat, quick, sweet, express bake 1.5- or 2.0-pounds, dough, jam, cake, sandwich, and bake. See how your bread is baking using the see-through window also with LED lights on the control panel. Make lush moist cinnamon raisin bread, artisan breads, oatmeal bread, or whatever you can dream up with made-from-scratch flavor. Buttery dinner rolls have never tasted better than the ones you make. You can make gluten-free bread as well. Select the crust color you like from light to dark. These recipes are included in the recipe booklet you’ll receive with your bread maker. 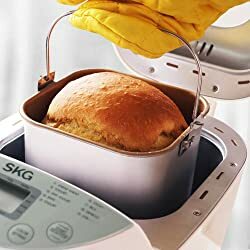 The bread maker bakes at 260-degrees F.
The bread maker fits your countertop measuring 16-inches deep x 11-1/2-inches wide x 12-1/2-inches tall weighing 18.6-pounds. Plug the 3-prong grounded UL® listed cord into a 110/120-Volt, 50/60 Hz receptacle. It does not work on 220/240-Volts outside the USA or Canada so buy an adapter. The power is 600-Watts. You will receive with the Sunbeam® bread maker free recipes, 1-kneading blade (no extra one), and a 1-year Limited Warranty. It is made in China. Sunbeam® Bread Maker – bread baking the easy way! The Oster® brand is great! The model CKSTBRTW20-NP on Amazon.com® comes in white with silver trim at the top. The bread maker machine has many features and is reasonably priced. You can load your bread and other baked goods with fruit and nuts, flavorings, and spices. You and your family with enjoy award-winning home baked treats and bread quickly and easily. Baking in the Oster® will fill your house with the mouth-watering aroma instantly when it’s cooking. Using the EXPRESSBAKE® cycle, your bread will bake in under an hour. Set the machine for up to 13-hours delay time, go to work, and come home to an aroma-filled house with a 2-pound loaf of bread ready to eat. It’s that easy. 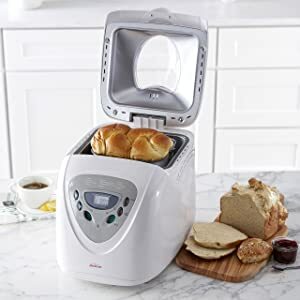 It has a warm setting to keep your baked goods from getting cold along with 12 bread settings and 3 crust settings for your bread varieties, dough, and jam. The machine has an LCD control panel easy to read using buttons. Make gluten-free bread using the wheat button since it has no specific button for gluten-free. 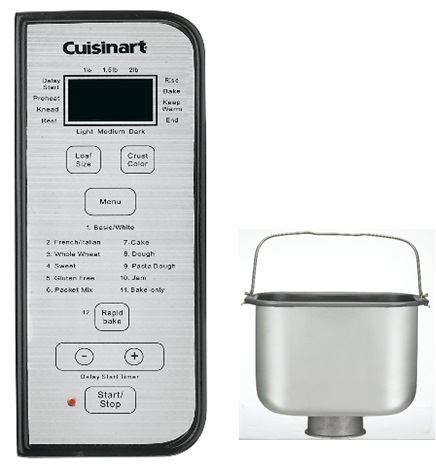 If you want the gluten-free button unit, buy the model CKSTBR9050-NP for $10 more on Amazon. 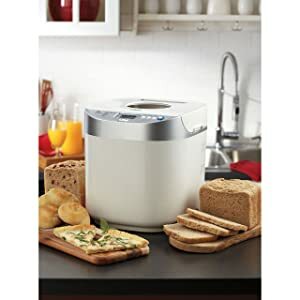 Make rye, pumpernickel, potato, oat, fruit breads, and many wonderful taste treats with this unit. 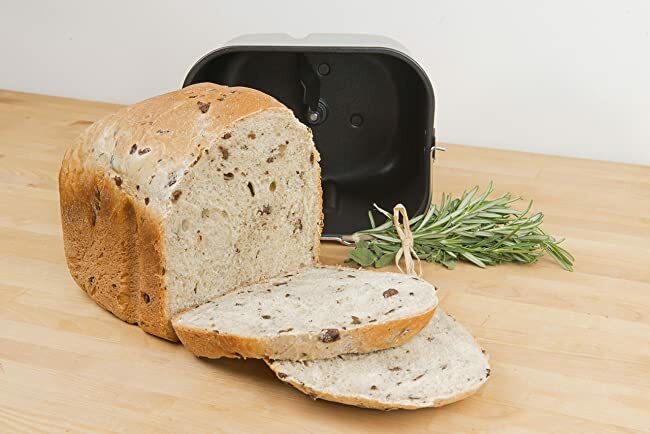 The bread pan is aluminum with a nonstick coating. I never put aluminum in the dishwasher because it tarnishes and nonstick coatings can be destroyed. It’s easy to wash the blade and pan in hot sudsy dish detergent. The dimensions are 12-inches long x 11-inches wide x 11-inches tall. The bread pan measures 7-inches long x 5.25-inches wide x 5-inches deep. The bread maker weighs 10-pounds. Plug the 3-prong grounded UL® listed 40-inch cord into a 110/120-Volt, 50/60 Hz receptacle. It does not work on 220/240-Volts outside the USA or Canada so buy an adapter. The power is 650-Watts. 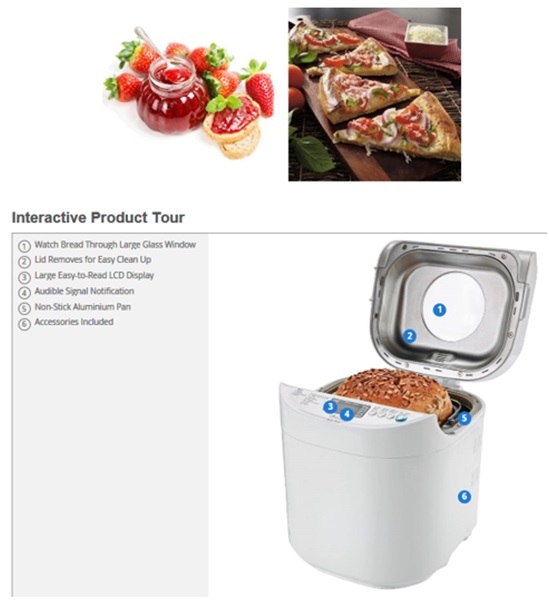 You will receive instructions, recipes, and a 30-day money back Guarantee if you are not happy with this bread maker. It is made in China. 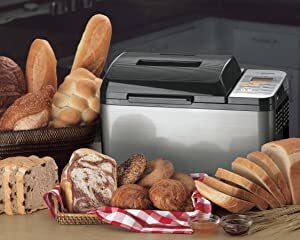 Oster® EXPRESSBAKE® Bread Maker Machine video. 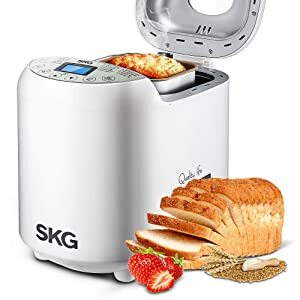 The SKG brand, ASIN B071GKYPQ3 on Amazon.com® is a top selling bread machine that is affordable in silver and white color. It is excellent for beginners. This bread maker makes tall loaves that most people don’t like. The nonstick coating inside the baking pan needs extra attention. It has 19 programs making it cost a bit more. The machine will make 3 different loaf sizes, 3 crust colors of light, medium, and dark, with its 15-hour delayed time feature with a 1-hour keep warm mode. It also has a 15-minute power interruption recovery for fresh breads anytime. Use a few clicks at the control panel following the easy recipes for adding ingredients for preheating, kneading, rising, and baking, plus more. The 19 programs are basic, quick bread, French bread, whole-wheat, gluten-free, corn bread, rice bread, jam, yogurt, and even more summer time treats and winter comfort food. Select your loaf size from 1-, 1.5- and up to 2-pounds for your family or for yourself. The outside housing is made of PP (polypropylene) plastic. The rubberized feet keep it sitting still on your countertop. Follow the instructions for using the first time by operating the machine on the #19 bake cycle for 10-minutes to burn off oils applied when manufacturing. Do not use metal utensils in the bread maker or pan or it will ruin the finish. Use wooden tools. Don’t wash the beater or bread pan in the dishwasher; use the sink with warm water and dish detergent. The dimensions are 13-inches tall x 11-inches deep x 9-inches wide weighing 8.6-pounds. Plug the 3-prong grounded UL® listed cord into a 110/120-Volt, 50/60 Hz receptacle. It does not work on 220/240-Volts outside the USA or Canada so buy an adapter. The power is 550-Watts. You will receive instructions, 19 different recipes for the 19 programs, measuring spoon, measuring cup, and a 1-month free trial. 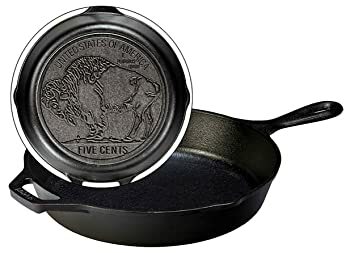 The 2-year Warranty covers all parts and accessories when bought on Amazon. It is made in China. SKG Bread Maker demonstration video. 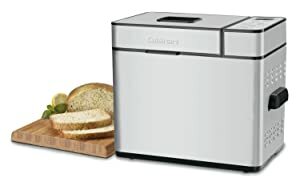 The Cuisinart® folks make fantastic kitchen appliances to include their CBK-100 bread maker shown on Amazon.com®. 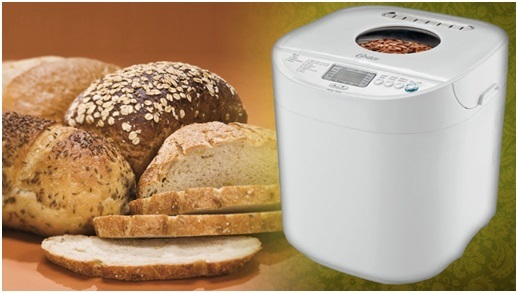 It is a high-end bread maker machine in a silver colored finish and BPA-free. Whip up a fruit bread with craisins (dried cranberries), raisins (dried grapes), zucchini, or banana nut. Make gluten-free and low carb breads in under 3-hours. The control panel lets you preheat, knead, rest, rise, bake, and keep warm when making your French or Italian bread from scratch or a box mix. Whip up whole-wheat, sweet bread, cake dough, pasta dough, pizza dough, and make jams too. With the 12 programs create baked treats and bread of 1-, 1-1/2-, or 2-pound hot loaves. It has a 13-hour delay-start time, 3 colors for crust setting, a viewing window on top, with a removable lid, bread pan, and metal paddle. All parts are easy to clean not in the dishwasher with simply wiping the outer housing with a sudsy washcloth or sponge, rinse, and towel dry. The machine has a 15-minute pause, bake only option, and power failure backup, with cool handles. The dimensions are 14.5-inches long x 7.5-inches wide x 12.5-inches tall and it weighs 22-pounds. Try this recipe from Cuisinart®; it’s over the moon delicious. You will receive recipes, instructions, a measuring spoon, and a measuring cup. The 3-year Limited Warranty covers all parts and accessories. It is made in China. Cuisinart® Bread Maker demonstration video. The Panasonic® company makes superb kitchen appliances for home users and professional chefs too. The model SD-YD250 is perfect for a large family making the larger 2.5-pound loaf. The control panel settings are for white, whole-wheat, multigrain, French, quick breads, pizza, and cakes. Make dough for homemade pizza adding all the topics you love without the cost for each one at a pizza place. It makes pita bread but you’ll have to put it in the oven to toast it. It’s good! It does not have a viewing window and is made of steel. The 13-hour delay start timer and programmable menu options make meal planning easier and your bread will be done when you get home. Or, start it at bedtime and your bread will be ready in the morning. The nonstick inner bake pan and build-in handle helps your finished bread to be easily removed from the machine. 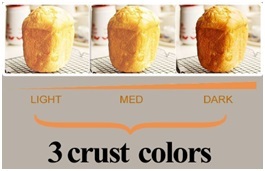 Choose your 3 different loaf sizes of medium, large, and extra-large with 3 shades of crust from light to dark. The yeast dispenser is handy and convenient when adding yeast to your recipe. You simply pour the yeast at the optimum time to ensure perfect bread each and every time you make bread calling for yeast. Or use that slot for adding raisins and nuts chopped fine. I love that yeast smell and taste best. Set and control the entire bread-making process with touch buttons and a bright, easy-to-read LCD display with beeps too. And you have the power interruption protection on this machine with a safety fuse. The bake modes are bake, rapid bake, raisin, and sandwich. The dough modes are pizza, rolls, and raisin dough. The indicator lights tell you when it’s baking and when the process is finished. The dimensions are 13-3/8-inches wide x 9-1/16-inches deep x 14-inches tall and it weighs 15-pounds. You will receive recipes, instructions, kneading blade, a measuring spoon, and a measuring cup. The 3-year Limited Warranty covers all parts and accessories. It is made in China. Panasonic® Automatic Bread Machine unboxing, review, and demo by the British Texas family video. The Kuissential™ model number BMC-001 shown on Amazon.com® will make from 1.5- to 2-pounds of bread and lush apple cake plus more delicious recipes. This 2-pound bread maker is affordable and sells well. The bread machine is easy to use. Put in the ingredients, and select on the control panel your bread type, loaf size, crust color, and go. Add nuts, fruit, and other items using the auto-dispense feature in the bread mode. The preprogrammed modes are for basic (white and mixed breads), French, whole-wheat, sweet, rapid, multigrain, sandwich, gluten-free, dough, cake, jam, bake, and home-made (customizable setting). It will make pizza dough and other fancy breads. You will have 13 programs already set, and a 13-hour delay-start feature. Check the viewing window to see how your product is progressing without lifting the lid. If the power goes out while the bread maker is in operation it turns on again within 10-minutes. The machine beeps when the bread is done. The User’s Manual states: Never immerse the bread pan in water or any other liquid and WARNING: The parts and accessories of the bread machine are not dishwasher safe. The loaf pan is coated with a nonstick surface and is easy to clean by hand. The blade is metal and coated and is easy to hand wash too. The dimensions are 10-inches wide x 15.5-inches deep x 12-inches tall and it weighs 12-pounds. You will receive recipes, instructions, kneading blade, a measuring spoon, and a measuring cup. You can find more recipes at the Kuissential™ website here. The 2-year Limited Warranty covers all parts and accessories. It is made in China. 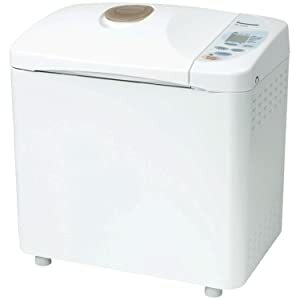 The ZOJIRUSHI is a Japanese Corporation, and the model BB-HAC10, is a small bread maker shown on Amazon.com® ideal for making soft, warm, beautiful bread every time. Because it only makes 1-pound loaves, it’s best for a smaller family. It is the premium white color to go with your kitchen décor. Being taller, it will fit smaller countertops in kitchens. Choose at the digital control panel on the front if you want regular, soft, or firm bread. The programs will make bread in less than 2-hours. This is the perfect machine for a single person or couple and I love it! Enjoy the 13-hour delay timer to have your bread ready and warm when you wake up or when you get home. The preprogrammed settings are basic bread (regular, firm), soft, French, dough, cookie/pasta dough, cake, jam, and quick bread. You can also make your own custom recipes for pasta dough and cookie dough. Just leave the gluten out when making gluten-free bread. The outside dimensions are 8.5-inches wide x 11.25-inches deep x 12.25-inches tall and it weighs 13.3-pounds. Plug the 2-prong polarized UL® listed cord into a 110/120-Volt, 50/60 Hz receptacle. It does not work on 220/240-Volts outside the USA or Canada so buy an adapter. The power is 450-Watts. You will receive recipes, video instructions in English, User’s Manual, and one kneading blade, a measuring cup, and a measuring spoon. The 1-year Limited Warranty covers all parts and accessories. It is made in China. Zojirushi America demo from manufacturer video. The Breville® Custom Loaf™ is just that; make it the way you want for 1-, 1-1/2-, 2.0-, or 2-1/2-pound (family size) loaves. The high-end model BBM800XL is a best selling medium to large bread maker with its outside housing made of brushed stainless-steel. This machine has a dispenser on top for adding nuts and fruits so you won’t need to open the lid as with many other brands. I t releases the fruits and nuts that you’ve put into the dispenser at the correct time when it’s kneading so that it’s totally combined within the dough. It has no yeast dispenser. Make your selections on the control panel, set the time, and it will tell you when to add up to 3/4-cup of the nuts, seeds, cheese, and fruits. You will receive a huge amount of recipes—46 in all for basic, whole-wheat, gluten-free, crusty loaf, sweet, yeast-free, pizza dough, jam and with 9 more custom recipe charts. The recipe booklet also has 6 yeast-free recipes. You can also use box mixes made for a bread maker machine. 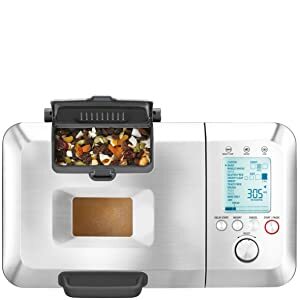 With the 13 automatic settings and 3 crust colors to include the 4 loaf sizes on the LCD control panel, you will have your item baked in no time. The control panel also shows you the process with that indicator. It’s truly a smart bread maker! It picks up where it left off if there is a power outage. It has a delayed time setting for all baking except ‘bake’ only and making jam. The kneading paddle is collapsible after it mixes all the ingredients. This lets it lay flat before it starts to bake for a smaller hole at the bottom of your loaf of bread. The fixed paddle stays immovable and does not collapse when you make jam or jelly. For jam and jelly, you will receive and use the fixed paddle. The outside dimensions are 9.8-inches deep x 15.7-inches wide x 13.9-inches tall and it weighs 16.85-pounds. 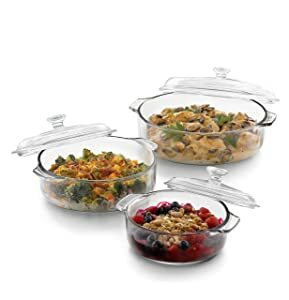 5-1/2-inches wide x 7-1/2-inches long x 5-1/2-inches deep and it is aluminum with a nonstick coating inside and not dishwasher safe. It does not come with a measuring cup or spoon; use your own. Plug the 3-prong grounded UL® listed cord into a 110/120-Volt, 50/60 Hz receptacle. It does not work on 220/240-Volts outside the USA or Canada so buy an adapter. The power is 830-Watts. You will receive recipes, instructions, 1 collapsible kneading paddle for bread and dough, and 1 fixed paddle for jam only. The 1-year Limited Warranty covers all parts and accessories. It is made in China. Breville® Bread Maker: The most advanced bread machine yet—sundried tomato and pita bread video. My mom told us kids not to run, jump or bang doors when her cakes or bread were in the oven because that vibration would make them fall. She was right! Do not make meatloaf in the bread makers unless the instructions say you can; not designed for greasy food. 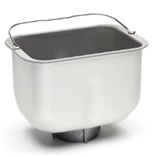 The bread pan bucket with handle is the part that comes out of the machine that your ingredients will go in. Always pull it out when putting in your ingredients. Do not use metal utensils in the bread maker or pan or it will ruin the finish. Use wood, plastic, or rubber. Fleischmann’s® yeast is an old favorite before bread makers and it’s now made specifically for bread machines. 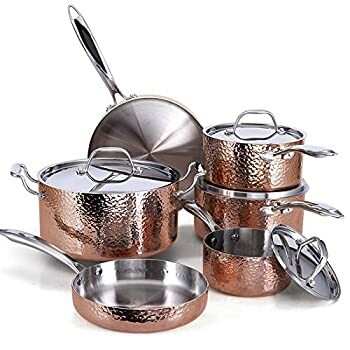 It’s best to wash the beaters and bread bucket by hand; the dishwasher water is too hot and the detergent too strong and will ruin the nonstick coating. Be cautious: When your bread is done, it is hot—and so is the bread bucket; use mitts or a thick pot holder. Cool your bread on a wire rack so it cools evenly and is not soggy on the bottom when sitting on a plate. 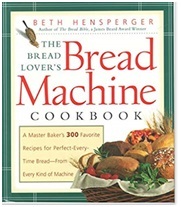 This is a great Bread Machine Cookbook on Amazon. Bread Machine Basics with tips for success video. Let me know about your success (or despairs) with your best bread maker machine and the comments section below. I’ll give you my replies soon. Happy shopping and happy baking!